1. How should you help prepare your pet for surgery? a. Pre-anesthetic bloodwork: It is best to have a blood screening performed to make sure that your pet can safely undergo an anesthetic procedure. Any underlying liver or kidney disease will influence your pet's ability to process and clear the anesthetic drugs and any prescriptions sent home after surgery. Assessing the red blood cell and platelet count would help prevent any complications during and after any surgery. b. Fasting: The night before any surgery, you should allow your pet to eat dinner; but they should not be allowed to have breakfast the morning of surgery. Free access to water is allowed the morning of surgery. c. Routine medications: It would be best to call the Four Paws HealthCare Team at (925)-829-PAWS (7297) to determine what chronic medications are allowed the day of surgery. 2. What can you expect the first few days after surgery? a. Lethargy: Most pets that have undergone surgery will be tired for the first couple of days after their procedure. Most people are surprised how fast their pets will bounce back after a surgery; therefore keeping your pet quiet to allow uncomplicated healing may become a challenge. Call us if you feel that your pet is too active after surgery. b. Constipation: Most pets will experience constipation to some extent. This is related to the use of certain pain medications routinely used during your pet's surgery. In most instances, it will resolve in a few days without any medical assistance. If your pet experiences constipation greater than 4-5 days; call us for advice. c. Pain: Most pets hide their pain; but it definitely affects them. We strongly advise that your pet benefits from continued pain management for 5-7 days after surgery. Sometimes their pain can exceed what the medications can control. Signs of excessive pain can include panting, restlessness, pacing or vocalizing. Do not hesitate to call us if you feel that your pet is having a hard time with pain postoperatively. d. Coughing: Almost all surgery cases will have a breathing (endotracheal) tube place. This guards your pet's airway during surgery. The breathing tube can irritate the windpipe; therefore a cough can rarely occur for a few days after surgery. Usually the cough is very mild and doesn't generally require medications. 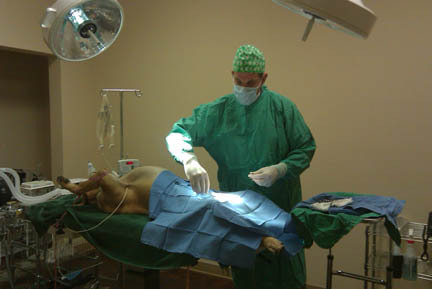 e. Incision Care: It is good habit to inspect your pet's incision once daily. Any excessive swelling, oozing / discharge, redness or loose stitching should be reported to the Four Paws HealthCare Team immediately. Excessive licking may also indicate a problem. f. Elizabethan Collar ("E- Collar" or "Cone"): Pets generally do not understand that it is best to leave their incisions alone. Most all will lick, groom or chew at stitches because healing incisions can be uncomfortable and itchy. We strongly recommended that your pet use an e-collar at all times. Eating with the e-collar can be difficult for some pets; so moving their food and water dishes into a corner or against a wall may help. Yes. Here at Four Paws Veterinary Center we utilize human and university-based medications and anesthetic protocols. All pets will be thoroughly examined prior to receiving any anesthetic drugs. Any concerning exam findings or pre-anesthetic blood abnormalities will be explained in a simple and easy to understand manner so that the safest decisions for your pet can be made. All pets will receive special medication prior to anesthesia to reduce the overall amount of anesthetic drugs required and to make for a smooth and trouble free anesthetic procedure. All anesthetized patients will be monitored by a dedicated nurse who will constantly monitor your pet's level of anesthesia, blood pressure, heart rate and rhythm, respiratory rate, and blood oxygen levels. Not all risk can be avoided, but we are committed to ensuring a safe and comfortable anesthetic event for your pet. 4. Will my pet have stitches? In most cases, yes. For some surgeries, particularly spays and neuters, we may use absorbable sutures underneath the skin. These will dissolve on their own and do not need to be removed. Most other surgeries will require skin stitches. With either type of suture, you will need to keep an eye on the incision for swelling or discharge. If there are skin sutures, these will usually be removed 10 to 14 days after surgery. Bathing is not advised for the first 10 days after surgery. 5. Will my pet be in pain? Beware that many over-the-counter pain medications (Tylenol, Advil, Motrin, Aspirin Acetaminophen and Ibuprofen) and most prescription-strength human pain medications are potentially poisonous to your pet. It is very important to let the Four Paws HealthCare Team know if you pet has received any of these types of medications; or if your pet has gotten sick by taking any medications. For dogs, we may recommend an oral anti-inflammatory the day after surgery and for several days after to lessen the risk of discomfort and swelling. We use newer medications, which are less likely to cause stomach upset and can be given even the morning of surgery. Cold compresses can also help with post-operative pain. Apply a cold compress for 5-10 minutes twice daily if your pet allows. Cats are even less tolerant of most pain medications. Although most oral anti-inflammatory pain medications are considered risky for cats; it may become medically necessary to prescribe these types of medications for short periods of time under the close supervision of your Four Paws Veterinarian. 6. What should I expect when I drop my pet off for surgery? Please make sure you provide us with an accurate phone number to reach you on the day of your pet's surgery. We may call during a surgical procedure to ask questions. And we will definitely call you after your pet has recovered from the anesthesia.